The ADIS16201 is a complete, dual-axis acceleration and inclination angle measurement system available in a single compact package enabled by ADIs iSensorTM integration. By enhancing ADI's iMEMS Sensor technology with an embedded signal processing solution, the ADIS16201 provides factory calibrated and tunable digital Sensor data in a convenient format that CAN be accessed using a simple SPI serial Interface The SPI Interface provides access to measurements of the following parameters: dual-axis linear acceleration, dual-axis linear inclination angle, temperature, power supply and one auxiliary Analog input. Easy access to calibrated digital Sensor data provides developers with a system-ready device, reducing development time, cost and program risk. The ADIS16201 also offers a comprehensive set of features which CAN be used to further reduce the hardware complexity of system designs. 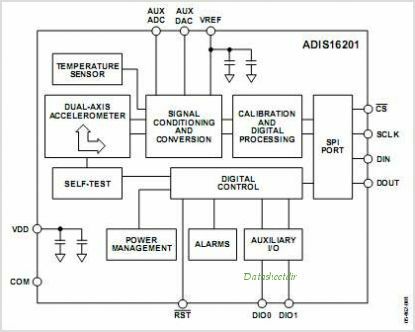 These integrated features include a configurable alarm function, auxiliary 12-bit ADC auxiliary 12-bit DAC configurable digital I/O port, and a digital self test function. The ADIS16201 offers two different Power Management features that CAN be enabled via the SPI port; a programmable duty cycle sleep mode for systmes that do not require continuous operation and a low power mode for systems that CAN trade reduced sample rates for more efficient power operation. The ADIS16201 is available in a 9.2mm x 9.2mm x 4mm Land Grid Array (LGA) package with a temperature range of -40C to +125C. This is one package pinout of ADIS16201,If you need more pinouts please download ADIS16201's pdf datasheet. 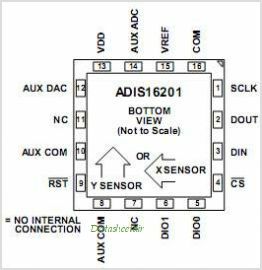 This is one application circuit of ADIS16201,If you need more circuits,please download ADIS16201's pdf datasheet.